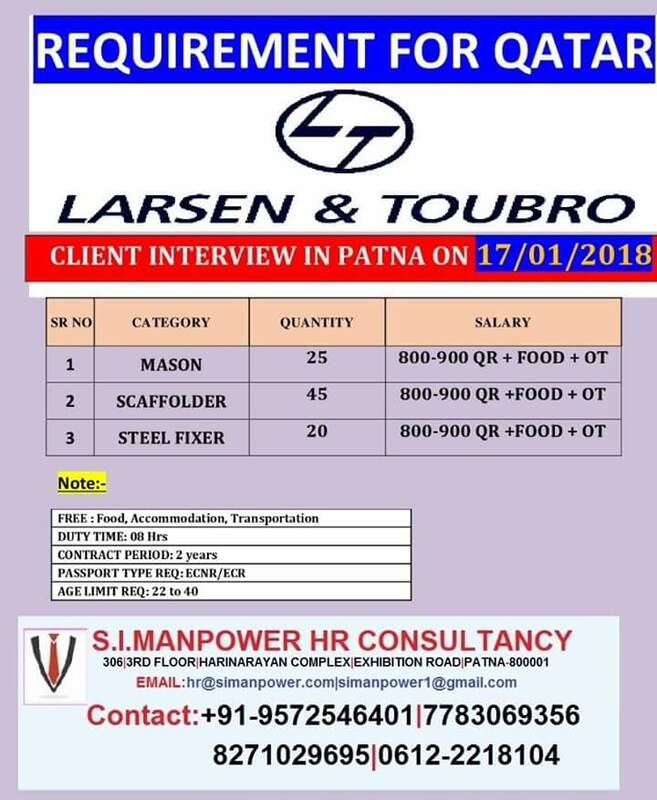 CHECK LATEST GULF JOB INTERVIEW IN PATNA – URGENT MANPOWER REQUIRED For a Leading Company MAINTENANCE PROJECT. Interested and Eligible candidates can apply. MECHANICAL ITI -2 Years – Mechanical Foreman required 10 Years Of Exp, 60 vacancies are available. Mechanical Technician required 7 Years of exp 150 vacancies are available, PLUMBER – required 7 Years of exp 100 vacancies are available. PUMP OPERATOR Required 7 Years of Exp, 100 vacancies are available, ASSISTANT PLUMBER required 4 Years of Exp 150 vacancies are available, ASSISTANT MECHANICAL TECHNICIAN required 4 Years of Exp, 150 vacancies are available. 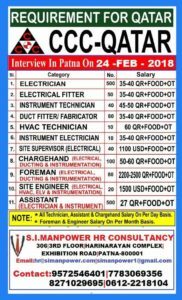 HUGE LATEST GULF JOB INTERVIEW IN PATNA- HVAC ITI – 2 Years HVAC FOREMAN required 10 Years of Exp 60 vacancies are available, AC TECHNICIAN required 7 Years of Exp 150 vacancies are available, ASSISTANT AC TECHNICIAN required 7 Years of Exp 150 vacancies are available. ELECTRICAL ITI 2 Years- ELECTRICAL FOREMAN required 10 years of Exp 60 vacancies are available, ELECTRICAL TECHNICIAN required 7 Years of Exp 150 vacancies are available, CONTROL TECHNICIAN required 7 Years of Exp, 90 vacancies are available, L V TECHNICIAN (FIRE, ACCESS, ETC.) required 7 Years of Exp, 72 vacancies are available, LIFT TECHNICIAN required 4 Years of EXp, 40 vacancies are available. ASSISTANT ELECTRICAL TECHNICIAN required 4 Years of EXp 150 vacancies are available. For more LATEST GULF JOB INTERVIEW can visit this site and check the latest Gulf Job interviews that have been recently posted. NEW GULF JOB INTERVIEW IN PATNA- Aspirants who are Searching for more latest GULF JOB INTERVIEW can check the latest Job Interview posts that have been recently posted in this site. HVAC CONTROL TECHNICIAN required 7 Years of Exp available vacancies are 100, CHILLER OPERATOR required 7 Years of Exp, 100 vacancies are available, BOILER OPERATOR ( STEAM) required 4 Years of Exp 40 vacancies, BMS OPERATOR required 4 Years EXp 40 vacancies are available. R.K INTERNATIONAL, Mr. Manoj, Mr.Subhas, Mr. Rakesh Contact: 011-45335533, 45335534, 45335535. I have one year web developer experience in india and good typing speed.please help me. i m interest to do job .IM ENGINEER IN ELECTRONIC & COMMUNICATION. ALSO I COMPLETED CNC MACHINE OPERATING AND PROGRAMMER, ALSO COMPLETED ITI IN CONSTRUCTION SUPERVISER, CONSTRUCTION TECHNOLOGY. ALSO COMPLETED GREEN HOUSE MANAGEMENT CERTIFICATE COURSE AND ALSO COMPLETED PCB DESIGN COUSE . I am electrical engineer (diploma) experience 2.5 years in (hotel plant and maintenance working)(ro,water treatment plant,sewerage treatment plant and electrical panel and motor)I’m good working knowledge.